Little Theatre, Dublin Road on Friday 11 September 2015 at 8pm. After the official business, our annual Jim Quigley Award will be presented to the Skerries Volunteer of the year 2015. 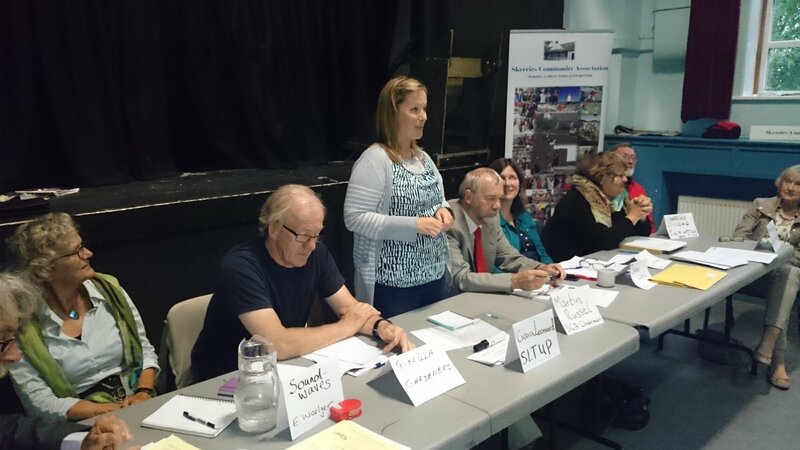 This year, there will be vacancies on our Board of Directors – if you’d like to help “Make a great town even better,” why not run for election? Nomination forms can be obtained at the reception desk of our Community Centre and must be with our secretary c/o the Skerries Community Centre by Tuesday 8 September at the latest. You must be a member of the Association to go forward as a director. You can become a member at the Community Centre (Reception Desk) or by signing up online. Membership is free, and open to all over 18s who are living in Skerries. See above for some of the fun of last year’s AGM! 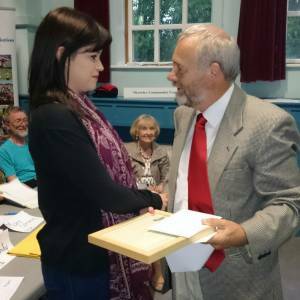 The Skerries Community Association Ltd. is an umbrella group comprising many committees, made up of several hundred volunteers, devoted to making the quality of life in Skerries even better. 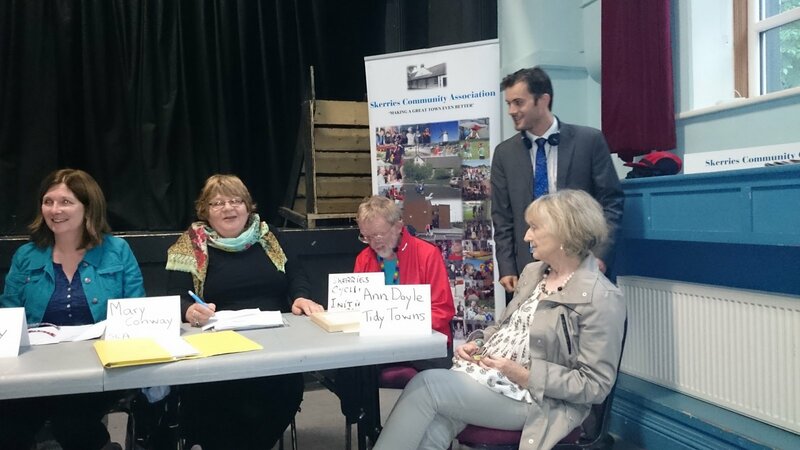 Skerries Community Association is also the parent organisation of Skerries Community Centre. In legal terms, the SCA has the structure of a Company Limited by Guarantee. We are, of course, not-for-profit – but we still must comply with all relevant legislation and requirements for companies. I write this report in the slightly uncomfortable position of having become Chair only one month ago. I cannot therefore proceed to report on the work of the SCA without giving all due credit to my predecessor Ciara Leonard, who brought such enormous energy and enthusiasm to the role of Chair. We are an umbrella group for the committees listed above, and their achievements in the past year are detailed elsewhere in this report. We also work alongside a great many of the other organisations and clubs that make Skerries what it is. On behalf of the entire board I wish to extend a heartfelt thank you to everyone who volunteers their time to enrich the life of our town and make Skerries such a great place to live. We could not fulfil our role without the support of, and a good working relationship with, Fingal County Council and our elected representatives at local and national level. 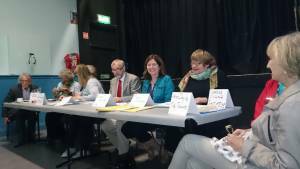 The Skerries Community Liaison Committee has been a terrific forum for effective and constructive engagement with the County Council. I sit on this committee with my colleague Jane Landy. We meet on a quarterly basis and anybody living in Skerries can submit an item to be discussed. But the work of the SCA is a year-round process and I would like to thank our elected representatives and council officials for being consistently available and supportive. There are a few highlights of the past year in Skerries I would like to dwell on for a moment. August marked the Centenary of the Old School House. My colleague Mary Conway and her team did great work organising the event to mark this occasion. 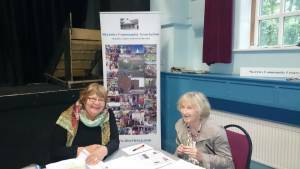 A huge turnout reflected on the history of our town with readings, songs, photographs and letters from pupils from 1914 to 2014. This year also saw a wonderful addition to the new Floraville Community Garden in the form of the seals sculpted by local artist Paul D’Arcy. Great thanks is again due to the Chamber of Commerce for their work in bringing this amenity to our town, and also for their continued work on the Patrick’s Day Parade and the annual Christmas Lights. Special congratulations to one of our newest committees, Age Friendly Skerries. 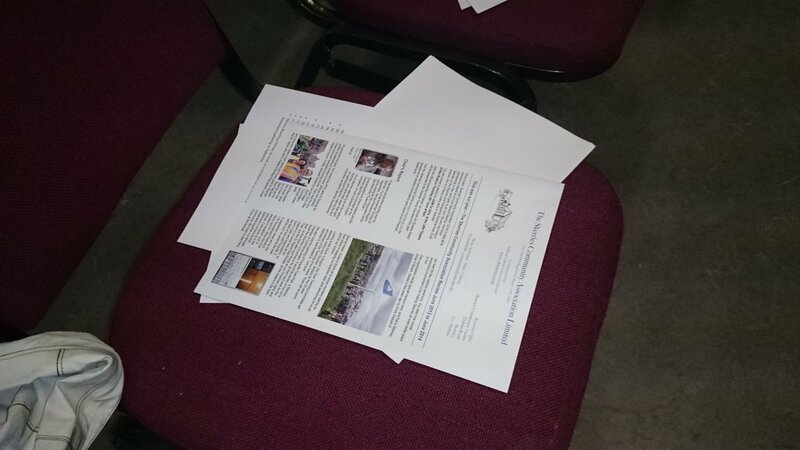 Earlier this year they won the Environment award at the Age Friendly Recognition and Achievement Awards ceremony in Cavan, and their information pack launch last month was attended by over 170 people. I was involved this year in the SCA’s submission in two projects, the Fingal Development Plan and the Town Park Masterplan. Both of these projects are ongoing and both will be the focus of a lot of our work in the year ahead. The Fingal Development Plan is a great opportunity to shape the goals and aspirations that we have, not just for Skerries, but for the whole of Fingal and the role of our town in achieving those goals. This 99-week process allows everyone to have their say in the strategic plan for Fingal and it has only just begun. The SCA is looking forward to being an active part in that process. As part of Age Friendly Action in Skerries, Fingal County Council launched the Masterplan for the Town Park. This was approved by the Council earlier this year and I was delighted to see many of the suggestions in our submission reflected in it. There is plenty of work ahead for the SCA in contributing to and enhancing the proposals it contains. I thank those colleagues who are stepping down from the Board for all their work: As well as my predecessor Ciara Leonard, they are Zaneta Wright (who did such sterling work as hon-sec), Maxine Watson and Martin Russell. 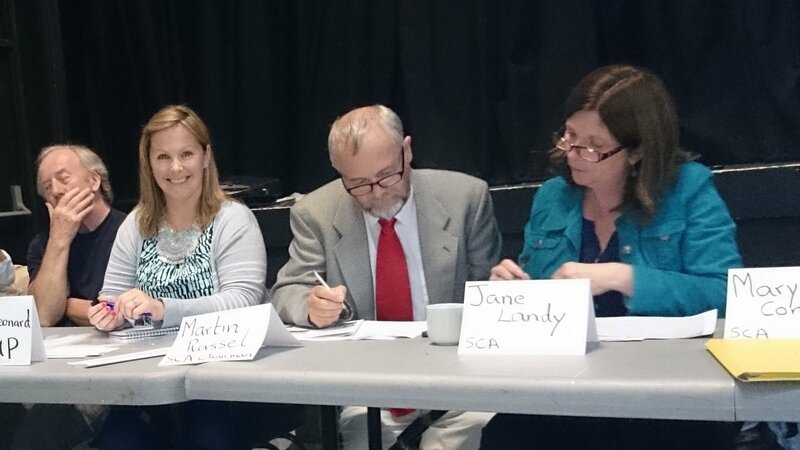 Martin will be well known to many as a former Chair of the SCA and a tireless activist for his community. As a director on the Board it was a pleasure for me to enjoy the benefit of his support, experience and friendship. It is with great sadness that we remember the passing of our friend and colleague George McCormack this year. George was a long standing member of the Board whose knowledge and dedication to Skerries will be deeply missed. Finally, I want to repeat that it would not be possible to include in this report a mention of all those who deserve it. So apologies to those left out and, on behalf of the SCA and the Board, I want to thank everyone who gives their time to enriching our town and especially those countless volunteers involved in our association for helping to make a great town even better. Nearly every day, the SCA Newsflash containing information on local events as well as “small ads”-type content and notifications, is mailed to subscribers. To subscribe, send an email with the subject “Newsflash Subscription” to info@skerriesca.com. You will be added to both the daily Newsflash and the Quarterly SCA Newsletter, which highlights the current work of our committees. 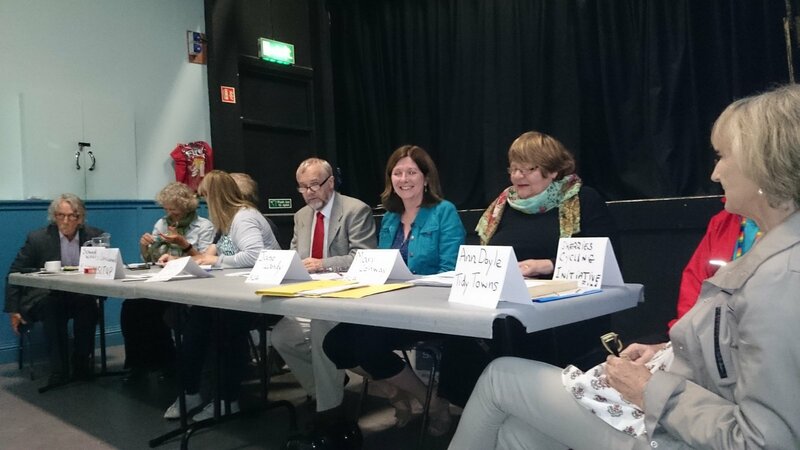 The last two years have been very busy and rewarding years for Skerries Community Centre-. During this time the Centre and the Old School have gone through a big transition, including replacement of the showers and toilets, the heating in both buildings and the windows in the Old School, improvements to the garden and repainting the Old School. Next steps include a new logo for the Centre and extra toilets in the Old School. All the painting and gardening improvements are thanks to the staff of the Centre, especially the CE workers, who are taking great pride in how the Centre looks. All staff are now wearing uniforms, which makes them easy to identify. An Age Friendly Skerries Information Pack was launched in August 2015. The Information Pack was developed to address the information needs of older people in the town, in particular our most vulnerable older people. It not only provides vital details on emergency services but also provides information on clubs and leisure activities for older people and will be an asset for all. Other projects either supported or initiated by Age Friendly Skerries include the upgrade and enhancement of the Town Park, follow-up on the recent Walkability Study with Fingal County Council (FCC), the roll-out of OPRAH (Older People Remaining at Home), a HSE initiative, and of a befriending programme to alleviate social isolation via Crosscare; the setting up of, and support for, Carers’ Meetings in association with the Carers’ Association, and the “Message in a Bottle” Initiative. We are doing the above in partnership with FCC (Eithne Mallin) who is coordinating the delivery of other age friendly services in Skerries by a number of organisations. FCC is supporting us by providing information about sources of funding and useful contacts etc. Mary Conway for Age Friendly Skerries. We are eagerly awaiting the 2015 results of the National Tidy Towns Competition on 28th September. Watch out for Nationwide on RTE that evening and hopefully you will spot Skerries. In 2014 we won the County Award and a Gold Medal in the competition, and were only 4 points behind the winner Kilkenny. So it really is nail biting time now. Community involvement is very important. The bird and bat nesting boxes made by Foróige and placed in appropriate locations by our local BirdWatch Ireland group, together with the multiple green flags obtained by the local schools, and the Adopt-a-Beach scheme, count in a big way. Well done and many thanks to all. The fifth year of Adopt-a-Patch was re-launched in March 2015, and there are now 50 patches adopted. We need a few more volunteers so if you think you can help, do contact us. Our work programme runs from early February until September each year. Our regular work parties meet on Monday mornings at 9.30 am in our store on Quay St – new faces always welcome. 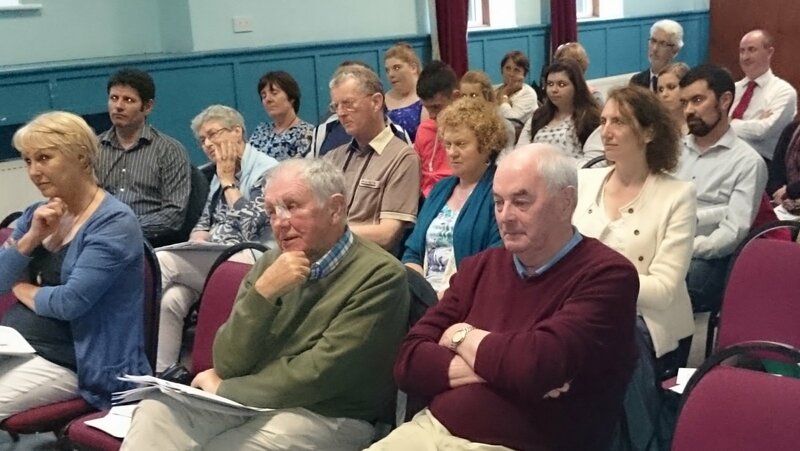 Skerries Reaching Out was set up to identify, using reverse genealogy, those who left Skerries, tracing them and their descendants worldwide, proactively engaging with them and inviting them to reconnect with their homeland. We also assist anybody seeking information on any past or present relative living in Skerries. We are a member of the Ireland Reaching Out Community – www.irelandxo.com. We have been of assistance with several family enquiries during 2014. One such request in is seeking any information on any present McKibben relatives in Ireland or indeed Skerries (originally the McKibbens from Balcunnin, Skerries). If anybody is interested in joining us to proactively research and assist Skerries’ descendants to trace their ancestors do get in touch. John Coleman, Skerries Reaching Out. SGG has been working with other local voluntary groups to engender awareness of sustainability issues in Skerries schoolchildren through practical action. In Skerries Educate Together, a new outdoor learning pavilion and amphitheatre was completed this year. Landscaping and planting is now well in hand due to super work by parents committee. The Local Agenda 21 Partnership Fund grant from Fingal County Council purchased topsoil, plants and other materials needed to create this wonderful outdoor learning space. Community Centre entrance and carpark: SGG was delighted to work with the gardening staff and management of the Community Centre, Tidy Towns and Skerries Allotments to secure shrubs and plants to create an attractive, colourful landscape around the Centre. Crann Pádraig Skerries is an environmental group which promotes and encourages the planting of broad-leaf trees. Happily Skerries is planted as best as possible with such trees. Requests for plants will always be considered from Clubs and Societies. (However Crann Padraig is not a substitute for commercial purchase. Individuals are not catered for.) Please note that permission must be obtained before any planting on either public or private land is undertaken. Our big undertaking in 2014 was the celebration of the twentieth anniversary of the Twinning Ceremony in Skerries in August, when we welcomed 41 visitors from the Canton of Guichen for a four-day visit. We offered a range of activities for the visitors to highlight our shared Celtic heritage. In Spring 2014 we had organised an exchange of photographers. This led to a wonderful exhibition entitled ‘Through Each Other’s Eyes’ in Skerries Mills. We had two projects in July of this year – a return trip of almost 40 participants, including a group of traditional musicians from Rush, to Guichen in July and our participation in an international youth camp in July, for which six students from Skerries Community College travelled to France for a three-week camp, constructing a shelter in the public skateboard playground in Laillé, one of the main towns in the Canton of Guichen. The An Post Rás is Ireland’s number one cycling event. It is an annual, eight-day, stage race around Ireland. In 2006, it finished in Skerries for the first time. In 2015, the committee celebrated 10 years of the Rás finishing in Skerries, and arranged yet another successful street party to welcome in the Riders. The sun shone, and a large crowd awaited them at the picturesque seaside town, bringing 8 tough days in the saddle to a stirring, atmospheric end. Our bike repair and maintenance course, run at the Well Fit gym premises at Skerries Shopping Centre over six mornings in May, was initiated by Skerries Tidy Towns with funding by Fingal County Council and the Department of the Environment under the Local Agenda 21 programme. Bike mechanic Paul Callan from The Rediscovery Centre, a social enterprise based in Ballymun, conducted the sessions. All 10 participants enjoyed the course and now feel confident about tackling bike repairs. Our Midsummer Madness Bike Week Fun Cycle on 21 June was a trip around the town and local housing estates exploring lesser known paths and laneways, and it ended with the traditional picnic. During the last year we made submissions to Fingal County Council on 30 km/h in residential areas, cycling in Town Parks and the draft County Development Plan. We continue to press for the completion of the cycle track from Balbriggan to Skerries, and for greater awareness of the importance of cycling to a number of areas, including the development of tourism in Fingal. To receive our regular cycling newsletter, just send an email to cycling@skerriesca.com. Our 2015 festival kicks off on 17th September and continues until the 27th. We had our Lego Family Fun Day in June, and great fun was had by all at the display area, the Lego build off, the Wheel of Fortune and the Schools Art Display. Among the events planned for September are an Art Trail with artwork displayed in 10-15 prominent locations around the town; our schools programme with artists and story tellers; the Mills Gig, featuring the Walls, Darling, and The Fontaines; a classical music night in Holmpatrick Church with Fingal Chamber Choir, strings, and more; our fourth Soundwaves Minecraft Project, with a week of online creativity followed by a Minecraft-themed wrap party; a new play from Sunday’s Child; a night of Music and Poetry in the Mills; our largest ever street party, with a bouncy castles, youth orchestra, Mr. Toots the tourist train, Clap Handies, street games, the rock trailer, and more. The Finale will be the annual fireworks display in the harbour. See http://skerriessoundwaves.com for our full programme. Sustainable Skerries has had a good year, with the Community Harvest Group membership remaining stable, and also with many people expressing interest in availing of the local, organic produce boxes next year. 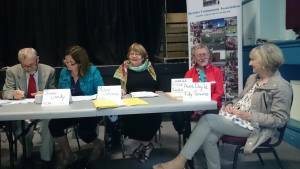 In community food garden news, a great team has been formed to facilitate the development of a community food garden within the Town Parks area, thanks to all who signed the petition. Plans are underway to host Sustainable Living workshops within the next few months; topics we hope to cover include foraging, mending and up-cycling and also waste. Over the past year the Skerries Skatepark Committee have been working closely with the community, Fingal Co Co, local councillors and politicians to create a viable proposal for the addition of a skatepark for Skerries. We are delighted that in July of this year the first major hurdle was crossed with the allocation of a site near Skerries Mills by Fingal Co Co as part of the Town Parks Masterplan. The next phase and new focus now is to investigate all forms of possible funding in order to keep the project moving. The Skerries Skatepark Committee would like to thank everyone involved in the process for the support and help to date. Mat May, for Skerries Skatepark Committee. It’s hard to believe that a year ago, this committee didn’t even exist! Skerries CoderDojo is a monthly coding club for kids aged 7 to 17 including those with no previous coding experience. The first “dojo” (club meeting) took place in September 2014. Over 30 helpers, organisers, and mentors ensure that the 70+ “ninjas” can get hands-on experience with coding during our monthly sessions. Bookings for our monthly sessions (which are free, but participants must bring a laptop and a parent if they are under 12) open about a week before the event on our Eventbrite page. The monthly sessions take place on the second Sunday of each month, from 4 p.m. to 6 p.m., in the Little Theatre. As well as being an SCA committee, we are also part of the international CoderDojo movement. We’re always on the look-out for helpers, especially for mentors who’d like to pass on their coding skills to the next generation! This entry was posted in Events, SCA by SMcK. Bookmark the permalink.